Dirk Bouts is considered the founder and principal representative of the School of Haarlem. In the 15th century this school was known for its innovations in the genre of landscape, imbuing it with a remarkable sense of depth. 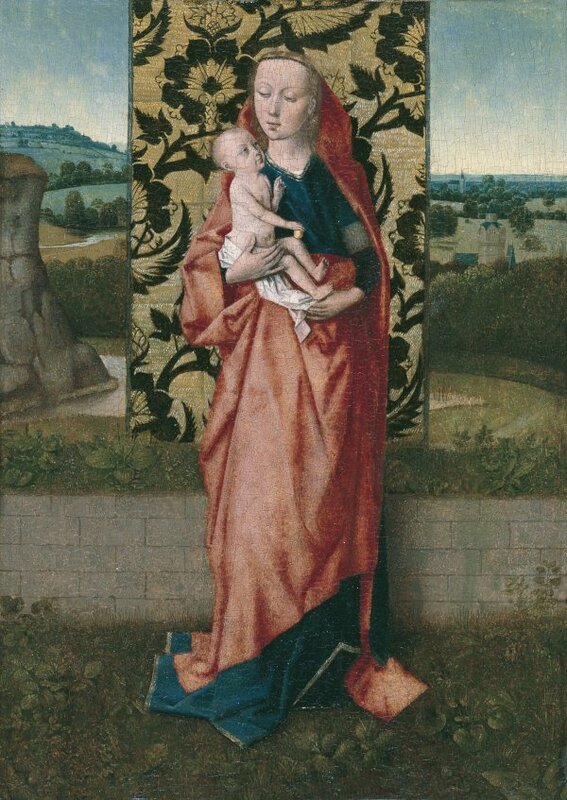 This work has been attributed to numerous artists in the past but it is now given to a follower of Dirk Bouts. The composition is inspired by the famous Virgin of the Fountain by Jan van Eyck (now in the Musée Royal des Beaux-Arts, Antwerp), with the composition simplified to its essential elements. The artist depicts the Virgin holding the Christ Child in the centre of the composition in front of a richly embroidered ceremonial cloth. Behind, a landscape recedes into the distance. Bouts was the artist who most focused on a reconsideration of this motif, although no other work of a similar type by his hand has survived. The size and subject of this panel suggest that it may have been intended for private devotion. Dirck Bouts was born in the northern Low Countries and moved to Louvain around the mid-1440s. His name regularly appears in the city’s archives from 1457. One of the great artists of the 15th century, Bouts’ painting reflects the artistic legacy of Rogier van der Weyden as well as the influence of contemporary artists such as Petrus Christus and Memling. Bouts was head of an important workshop in Louvain in which his sons Dirck the Younger and Aelbrecht worked. The present Virgin and Child is inspired by Van Eyck’s famous composition of The Virgin and Child at the Fountain (1439) in the Koninklijk Museum voor Schone Kunsten, Antwerp. Bouts modified the presentation to some extent but retained the essence of Van Eyck’s panel. Following the earlier composition, the Virgin is shown standing and holding the Christ Child. She forms the central axis around which the rest of the composition is structured and her figure is emphasised by the costly textile behind her (held up in Van Eyck’s original by two angels, not included here). Both Van Eyck and Bouts included a low wall of regular blocks just behind the cloth while Bouts replaced Van Eyck’s flower garden with a lush area of plants and grass that opens onto a landscape on both sides of the cloth. Among the art historians to propose the attribution to Bouts were Friedländer and Ebbinge-Wuben. Hoogewerff, however, suggested the Master of the Tiburtine Sibyll, while Schöne suggested the Master of Saint John on Patmos and Dirk de Vos proposed the Master of the Legend of Saint Lucy. Aware of these earlier suggestions, Eisler proposed to attribute the painting to a follower of Bouts. In his oeuvre Bouts developed and disseminated presentations of the Virgin and Child of this type. However, among autograph works by the artist no depiction of a standing Virgin in a landscape has survived, suggesting that the present work reproduces a lost original. To judge from its subject matter and dimensions this panel was probably intended for private devotion and emphasises the tender relationship between Mother and Child, expressed through their gentle gazes that counterbalance the rigidity of the figures. The Christ Child rests a small apple on one leg, referring to his role as Redeemer. This message is accompanied by others in the composition in which the wall and dense foliage behind it have been interpreted as references to the hortus conclusus or closed garden of the Song of Solomon, a text that exalts Mary’s purity. This reading is emphasised by the apple held by the Infant Christ and which refers to Mary’s role as the New Eve.